I have never been a good businessman. Coming up with products and marketing ideas is like an alien environment to me, and frankly looking at numbers just fills my brain with a high pitched whine not unlike the Emergency Broadcast System. If you remember the moment in Forbidden Planet when Robbie the Robot is ordered to kill someone and it short-circuits his brain, that’s pretty much how my brain responds to anything that smacks of accounting. I was blessed for some years to have an amazing business partner who dealt with all that stuff for me; however, it falls on me now and if I’m going to succeed and not end up in the code mines again, I have to make it work. To that end, I’ve been studying other creators who’ve made it work, including Brad Guigar, John Scalzi, Seanan McGuire, and most notably (for this post) Maggie Hogarth, whose Three Jaguars provides a working real-life template of just this process. To that end, I have decided to cultivate Three Lions (and an Otter), who are my own Artist, Marketer, and Business Manager analogues. 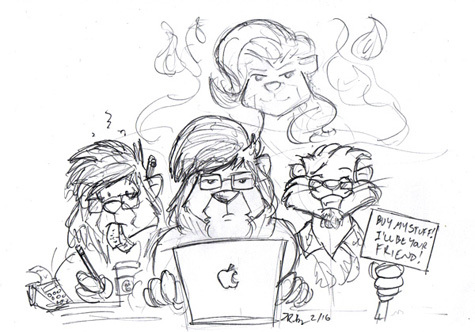 Except in my case they are Content Guy (Lion), Business Guy (also a Lion), Muse (a Lioness Spirit), and Fandom Guy (the Otter). Content Guy is the writer/artist. He’s the one who writes the stories, draws the pages, does the commissions, and grinds out those fourteen hour days of just making content when the creative fires are burning. Considering that Content Guy writes humor, comics, and pulpy adventure stories, he’s remarkably serious about his work. Business Guy and Fandom Guy largely exist to bring his work to the rest of the world, and he in turn is something of the group’s priest/medium to Muse. Business Guy is the one in charge of handling money, making travel arrangements, signing contracts, tracking ALL THE THINGS, and so on. This poor dude is strung out on espresso drinks and is currently in WAY over his head, but he’s the only one available to do the job and so he’ll have to rise to the occasion. He needs training, he needs resources, but most importantly he needs patience and love. He and Fandom Guy hang out a lot. Fandom Guy is a silly happy bouncy otter who loves tuna sandwiches and meeting with fans and making crazy pop references! He also loves manga, furry comics, and geeky STUFF and is therefore in charge of thinking up things that geeks will want to buy, as well as promotion in general. His duties also include making sure that everything Content Guy makes gets an AWESOME PASS to punch it up and make it better, from making the jokes funnier to making the art slicker to making sure that covers have Buster somewhere in a corner whenever possible. Muse is a spirit of some kind, unable to interact with the physical world and probably, to be honest, barely able to comprehend it. She is shrouded, mysterious, elusive, and beautiful. She’s also capricious and does what she wants, the rest of us be damned. On the other hand, she informs everything we do from start to finish and to a large extent we are all simply manifestations of her, which is probably what leads to her treating the rest of us this way. She works most directly through Content Guy, who occasionally chafes at being her slave, but also worships her like a goddess. Business Guy obeys her without question to best of his ability, and Fandom Guy thinks she’s totally awesome but wishes she would consider making his job easier by getting Content Guy to do some more mainstream stuff from time to time. By personifying them this way, I have also been able to analyze my own strengths and weaknesses and I know what to work on. Poor Business Guy, he needs some serious love! On the other hand, Content Guy is kind of a workaholic (and not the happiest of lions, it seems), so I need to keep that in mind, while Fandom Guy is fun and exuberant but also kind of an airhead who will probably need reining in from time to time, etc. Plus, what the heck, it’s just fun and helps me know myself a little better. It also makes the creative process a little less lonely: yes, it’s often a very solitary process, but within myself I contain a whole team. 😉 So c’mon, gang, we’ve got work to do! @the_gneech I think this is fascinating and would like to subscribe to your newsletter! … Which I kind of already do.